Maduro has accepted the election results, but serious questions remain whether he and his advisors will engage in the give-and-take necessary to make divided government work. He is restructuring his cabinet and has called on supporters to “relaunch” the Bolivarian Revolution. He says he will strenuously oppose any amnesty law for imprisoned opposition members – a top MUD priority – and that he will “go to combat” if the opposition tries to remove him from office. Despite its historic achievement, the opposition will face challenges to build sustainable unity. The MUD is a heterogeneous electoral alliance, and the hardline and moderate factions are likely to disagree about strategy – whether the time is ripe for pressing for Maduro’s resignation or for cultivating support from disaffected chavistas. The opposition faces the challenge of demonstrating a commitment to what they have criticized most about chavismo – democratic inclusion. If they want to put Venezuela back together, for example, the MUD will have to decide how to provide PSUV officials guarantees of political inclusion. Passing an amnesty law for political prisoners and addressing the dire economic situation are high on the MUD’s unified agenda – and probably will remain part of a consensus platform. Less clear is how aggressively the opposition will push its agenda from the National Assembly. Most in the MUD are more closely aligned with the moderate strategy of former presidential candidate Henrique Capriles, but others will want to push harder. They may try to remove chavista-appointed Supreme Court judges likely to oppose Constitutional changes that would curtail Maduro’s powers. The forced resignation of Guatemalan President Pérez Molina and the recent opening of an impeachment process against Brazilian President Dilma Rousseff may embolden similar initiatives in Venezuela. The country’s tarnished election system functioned better than many critics had predicted. The 74 percent voter turnout was eight points higher than the last legislative elections. Reports of violence and irregularities were few. The Armed Forces provided effective security at the polls, and behaved in a manner that suggests an interest in defending their institutional reputation. The National Electoral Council (CNE) disappointed many by issuing an unprecedented call for voting centers to remain open even if there were no voters in line, and for delaying reporting the final results, but the voting process was clean enough. Outside Venezuela, chavismo’s loss may be a setback from some leftists – but a relief for most others. Maduro’s defeat is a potential liberation from the albatross that the disastrous Venezuelan regime has become. For most left-leaning leaders, chavismo had become a deeply flawed project that has, for several years, been toxic. For anti-chavistas outside Venezuela (including some in Washington), the election results indicate that the way to overcome the catastrophe over which Maduro presided was not to threaten the regime with sanctions and encourage extremists in the opposition, but instead to push for the election to take place, with the most safeguards possible. There is precedent for Latin American dictatorships falling in elections that they put on the agenda and then could not stop. Although Maduro’s saber-rattling along the Colombian and Guyanese borders failed to divert attention from his internal mess, his rhetoric of resistance to yielding power suggests the international community should keep an eye on him in case he tries again. The Venezuelan victors should also understand the anxiety of their neighbors over the future of Petrocaribe and other initiatives. Venezuela under Chavez did an enormous service to the region by subsidizing oil in ways that helping governments achieve important social advances. Long before Chavez, Venezuela used its oil wealth to support allies. Such assistance is as important now as it has been for decades. * Michael McCarthy is a Research Fellow with the Center for Latin American and Latino Studies. Following a tense day of voting on Sunday, incumbent Hugo Chávez has won the Venezuelan presidential elections. 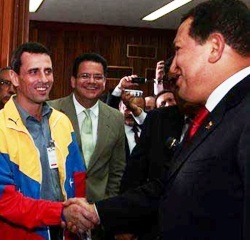 With 90 percent of the ballots counted, Chávez had approximately 7.4 million votes (about 54.4%) while opposition candidate Henrique Capriles won 6.15 million votes (44.9%). The president won every state in Venezuela except Táchira and Mérida, and secured a majority of votes in Zulia State, traditionally a bastion of support for the opposition. Turnout was nearly 81 percent, a very high figure, and thousands of Venezuelans cast their ballots at consulates and voting centers abroad. As of yet, there have been no allegations of voter fraud or post-electoral violence and both candidates appear to have accepted the result. A delegation from UNASUR “accompanied” the vote and has affirmed that the electoral process was legitimate. Chávez will embark on his third consecutive presidential term in January 2013 and, health permitting, will remain in power until at least 2019. 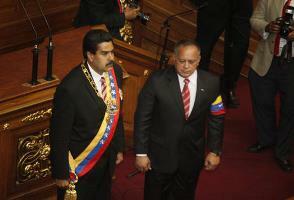 The ruling PSUV has a sufficient majority in parliament to ensure that Chávez will be able to legislate comfortably. However, should Chávez’s health prevent his completing the term, the PSUV lacks an obvious successor who could carry forward with the Bolivarian Revolution. Regardless, the Chávez agenda faces huge challenges, particularly with an economy rife with distortions and a security situation spiraling out of control. While Capriles and the opposition were defeated at the polls, his candidacy galvanized an opposition that is far better organized and more united than at any point since Chávez’s rise to the Presidency 14 years ago. 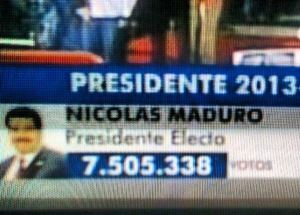 The 6.15 million votes Capriles received was the greatest number ever for a losing candidate in a presidential Venezuelan election, and kept Chávez’s margin of victory within single-digits. Clearly, a large segment of the population opposes further expansion of the Bolivarian Revolution. It remains to be seen whether a united opposition can complicate Chávez’s efforts to move Venezuela further down the road to his brand of socialism.